​Learning & Growing with Whatcom County! Catch the Son was started at Christ The Servant Lutheran Church in Bellingham, Washington, in 1985 to meet the needs of young families in our community and to provide a quality early childhood education program for young children. At that time, one teacher and 12 students met twice a week. Today, there are three teachers and 62 students meeting in five different sessions during the week. 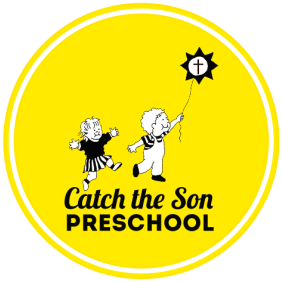 Catch the Son Preschool is a parent cooperative school offering a Christian-based early learning program. Our program is based on the belief that children construct knowledge through exploration and hands-on experiences, and that families are a child's first teacher and our partner in education. Our cooperative model involves parents working closely with teachers as they volunteer regularly as teacher assistants, and take on a school or classroom job. In the classroom, teachers provide an environment that exposes children to literacy, math, science, physical fitness, music and arts, all while paying special attention to growing faith in God and relationships with one another. Catch the Son is an outreach ministry of Christ the Servant Lutheran Church, responsible to the church council. Weather-related delays and closures will be posted on this page by 7:30am. We will follow Bellingham Public Schools lead...if they are closed, we are closed. If they are delayed, all Catch the Son classes are cancelled. Please refer to the Parent Handbook for the complete Snow/Inclement Weather Policy.